Sites are high level groupings of Trials which may equate to places where breeding / variety evaluation occurs (e.g. breeding station). Geographic coordinates can be assigned to enable illustration on a map. A ‘Site’ may consist of a whole farm, breeding station or other general environmentally homogeneous area, where planting occurs. Site Name M A name to identify the site. Site Type M Selection from defined or ‘classified’ Site Types. Site Types must have already been created using the Add Site function. Site Manager M An existing Contact - a person currently managing the site (not necessarily a user of this system). Start Date M Date the site commenced operation (Format YYYY-MM-DD). End Date M Date the site stopped operation (Format YYYY-MM-DD). Site Geometry M This field contains the geographic coordinates of the site. It is populated by the selection of the site on the displayed map. Design Type defines how a Trial or experiment is to be conducted. The fields capture the layout/method that will be used to plant the genotypes, the number of replicates, etc. The data entered here is used as input for external software, such as DiGGer, which may be used to create the design. 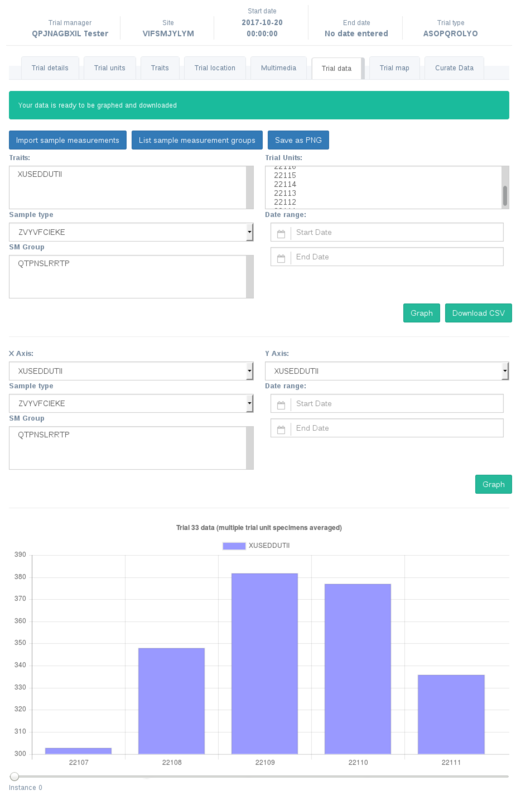 KDCompute has the ability to generate a Trial layout using DiGGer which will consume the data entered here. Note: Whilst an external application can be used to construct the Trial design it is not mandatory. Name of Design M A name to identify the Design Type. Name of Software M The software used for preparing the design. For example, DiGGer could be used to create a randomised block design. Template File M Defines how the parameters need to be inserted in the input file for the design software. Genotype Format M Format in which the Genotype Name and Genotype Id will be exported into the Trial design input file. The DesignGenotypeFormat must be GenotypeName | GenotypeId (eg VENTURA|41 ) to satisfy DiGGer requirements. Factor Alias Prefix M Prefix used to find the factor for the Trial Design Parameter while importing Trial design from the output file generated by the Trial design software. Breeding method is an additional descriptor of specimen which complements pedigree information and caters for a controlled vocabulary. Name of Breeding Method M Name of the breeding methodology. Note M A short description of the breeding methodology. Note: Where it is not important to specify a Breeding Method use the ‘Default’ Breeding Method. Trials are the equivalent to ‘field’ or ‘nursery’ experiments that are performed within a Site. Selecting Trial from the menu displays the list of defined Trials which the user/group has permission to view as shown in the following illustration. In the illustration above the Trial window shows several Trial records. The Actions cell has been highlighted on the second row to illustrate the range of buttons representing the Actions that can be performed for that Trial. Action The actions that can be performed for the Trial which are described in the following Trial Actions section. The following table lists all the actions that can be performed for the selected Trial in KDManage. Note: The presence of action types is dependent upon the Trial state - not all action types will be available for all Trials. Upload files Uploads files to this trial. Delete Trial Delete this trial. Note: This can only be done if there are is no trial data uploaded to this group and this trial is not part of an existing Trial Group. Users can also choose to clear the trial of trial units and trial traits if they wish. Import - loads data back into KDDart from scoring in KDSmart. Prerequisite: Before a Trial can be added, the Site to be used must exist. When defining the Trial Location, the Trial must be contained within the boundaries defined for the Site. To add a Trial select the Add Trial button to display the Add Trial window. Trial Name M The name of the Trial. A naming convention is suggested (e.g. a concatenation of site, type, date, number). Trial Number M The Number of the Trial, which could be sequentially assigned. Trial Type M Select from the list of Trial Types (A general type as opposed to design type which is a Trial specific definition). Site M Select from the list of sites to specify where the Trial is to occur. Design Type M Select a Design Type that identifies the Trial design. Trial Manager M Someone currently managing the Trial and defined in Contacts although they are not necessarily a system user. Start Date M The date the Trial commenced (Format YYYY-MM-DD). End Date M The date the Trial has/will end (Format YYYY-MM-DD). Note M Descriptive notes for the Trial. After entry of the Trial description, select the Add button to add this Trial. Selecting the Add a Trait button adjacent to the selected Trial will display the following Add Trial Trait window. The Trait is selected from a list of predefined Traits (refer to the Traits topic). When the Compulsory field is set to ‘yes’ the capturing of the trait will become mandatory when recording Trial data. To download Trial data in CSV format, select the Download button for the required Trial. For the selected Trial the downloaded file will contain the previous results of scoring already performed using KDSmart. The following download window will display. 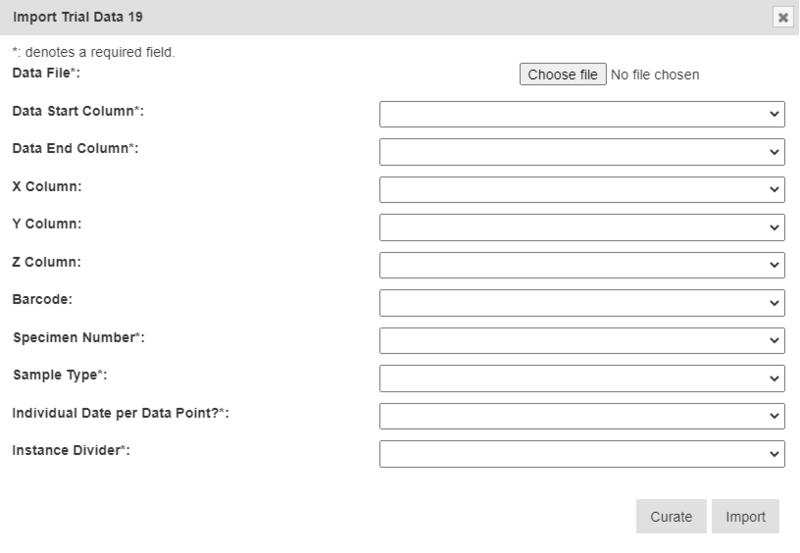 Complete the required fields then select the Download button to download a file. To edit an existing Trial select the Edit button in the Action column to display the update window. This window is the same as appears on the Trial Description tab. Trials may be deleted if they contain trial units, trial traits and uploaded multimedia. However, they will be removed and will not be retrievable. Users may also wish to delete trial units and trial traits from a trial. This effectively resets the trial for use. This is only possible if there is no Trial Data/Sample Measurements in Trial. The Export template action produces two CSV files from the selected Trial that can be loaded into the KDSmart application for scoring Trials. The download requires entry of the unit position for the row and column and for each Trait, the number of repetitions to be entered (default is one). When a Trait is not required zero should be entered to suppress the trait from the download file. Once the export has completed the number of Trial Units and Trait Columns in the file are displayed as shown in the following illustration. To download the template file to the workstation/laptop select the displayed link (illustrated above). Note The Trial template file contains empty Trait columns, without results. The import data for Trial window is displayed as shown and requires input as described in the following table. For referencing the CSV file contents, column numbering commences with zero. Data File Browse to locate and select the appropriate CSV file for import. Data End Column The last column in the CSV file containing data for import. Note: The number of ‘Unit Position Fields’ that appear following are variable, dependent upon the number of elements specified within the Unit Position. Unit Position Field for Row The column in the input CSV file that contains the ‘start position’ for the ‘row’, ‘plot’, etc. Unit Position Field for Column The column in the input CSV file containing the ‘start position’ or column for the ‘plot’. Unit Position Field for Block (not mandatory) The column in the input CSV file (numbered from zero) containing the ‘start position’ for the block. Sample Type The type of Sample, as defined in Type definitions. The import sample measurements for Trial window is displayed as shown and requires input as described in the following table. Data File M Browse to locate and select the appropriate CSV file for import. If required, sample measurements can also be uploaded and added to a new sample measurement group. Sample Measurement Group Name M Name for new sample group measurement. Note: new sample measurements cannot be added to existing groups so these names must be unique. The following table lists all the actions that can be performed for the selected Sample Measurement Groups in KDManage. Deleting Sample Measurement Groups is irreversible. To display the Trial units button select the button in the Action column to display the update window. To add a file to a Trial, click on in the Action column to display Upload file window. File types are defined in the Types page. Event Type M The type of event, as defined in Type definitions. Once a Trial has been added within a site, a geographic location can be added to a trial. A Google map will be displayed. Drag the map to the appropriate location then double click repeatedly to drill down to the required location to define the site. When the map displays with sufficient detail to draw the Trial area, define the Trial area by selecting the ‘draw new object’ polygon button and select on the boundary corners of the required area. 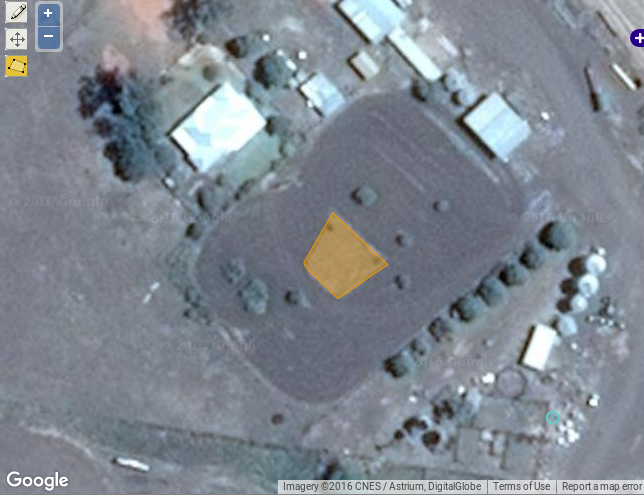 In the following image the Trial location has been defined and is highlighted in a darker yellow. The text box which appears above the map will contain the coordinates for the area that has been selected for the Trial location as illustrated next. The buttons at top left are to: ‘Draw a new object’ - to define the perimeter of the Trial ‘Select and Modify’ - To move the drawn object (using the centre button) or to change shape by selecting the edge buttons. ‘Select info’ to display the identification label for the area. 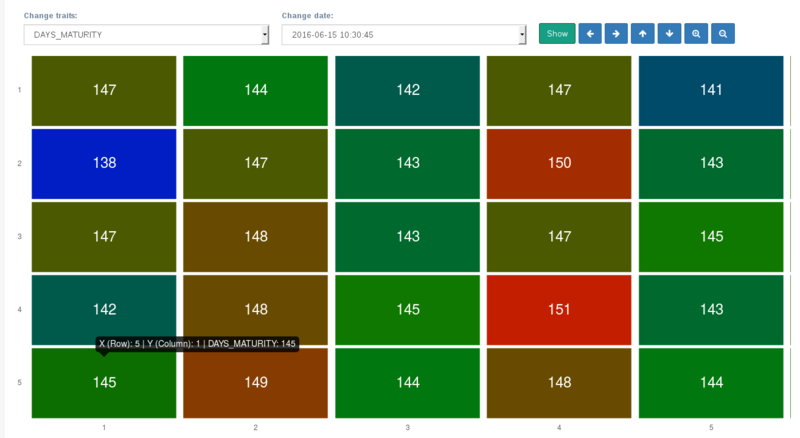 This screen caters for adding the layout for Trial Units or plots. 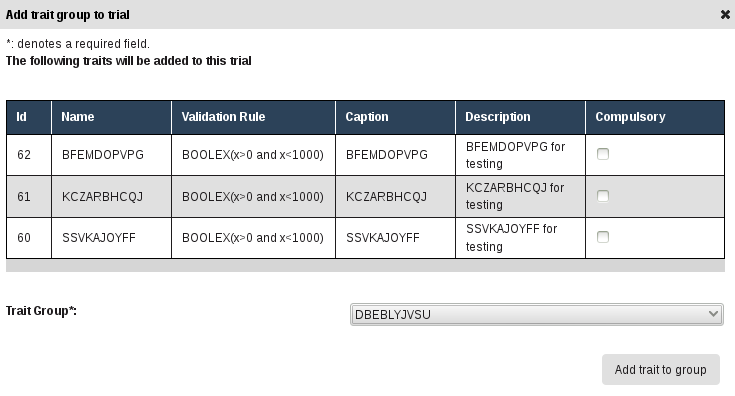 There are two ways to add Trial unit layouts: via CSV format and via KDCompute method (if configured). 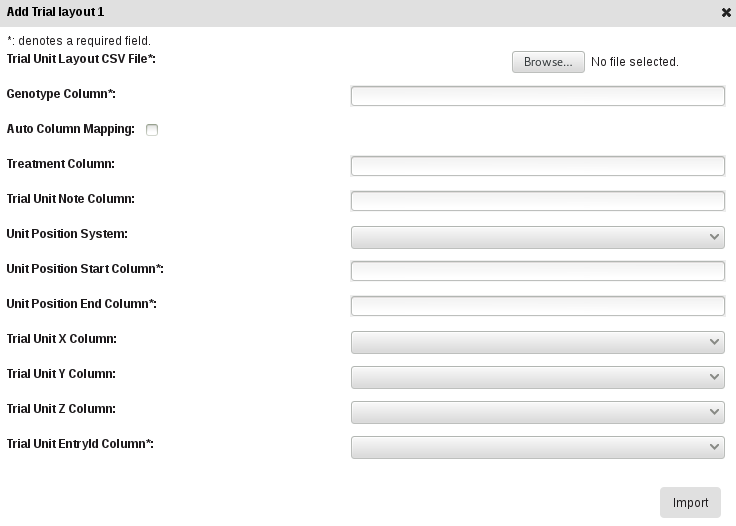 Trial Unit Layout File M Browse and select the CSV import file. Auto Column Mapping When a file is chosen this box will be selected if ‘Specimen’ is found in the header. This can be deselected if it is not the desired column. Specimen Column M The Specimen name column in the input file. It may be automatically provided using the Auto Column Mapping feature or manually entered. Number of Specimens per Unit M Define the number of copies of the same Specimen that will be added per Trial Unit. Unit Position Start Column M The Unit Position start column in the input file, numbered from zero. Unit Position End Column M The Unit Position end column in the input file, numbered from zero. Trial Unit X M Define the column that reflects X coordinates for Trial Unit Layout. This column must fall within the Unit Position Start and End Column ranges. Trial Unit Y M Define the column that reflects Y coordinates for Trial Unit Layout. This column must fall within the Unit Position Start and End Column ranges. Trial Unit Z M Define the column that reflects Z coordinates for Trial Unit Layout. This column must fall within the Unit Position Start and End Column ranges. Trial Unit EntryId M Define the column that reflects the EntryId for Trial Unit Layout. This column must fall within the Unit Position Start and End Column ranges. X, Y, Z and EntryId columns must all be unique columns. KDCompute method requires a working installation of KDCompute attached to your KDManage and specific set up for trial design plugins. Keywords can be added or assigned to Trial Units. From the Trial window, at the required Trial, select the Display Trial Layout Action button . At the required Trial Unit select the Keyword button . Select the Keyword from the dropdown List. Note: Multiple Keywords can be assigned. If the required Keyword is not appearing, new Keywords can be added via the Administrative Settings menu , top right. 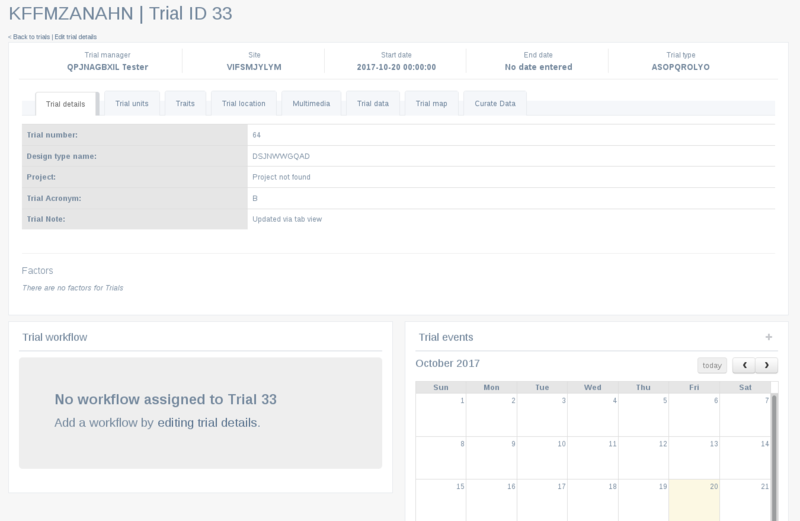 This page will display all the details of a trial. The actions described above are organised in boxes and tabs. Important Trial information will be displayed in the each of the tabs. To edit Trial details select Edit Trial details, below the Trial title and ID on the top of the window. Trial Units can be added and viewed on the Trial Unit tab. 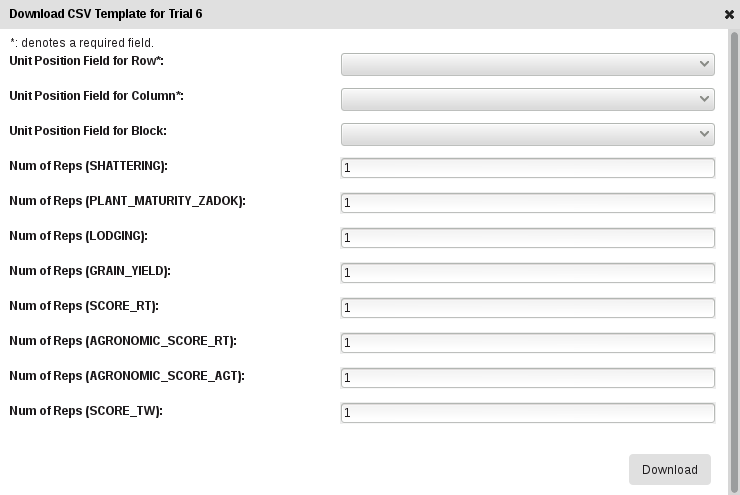 Newly created trials can have Trial unit layouts added via csv or KDCompute method (see Adding Trial Unit Layouts). After a trial unit layout is added, users may view the table of trial units. 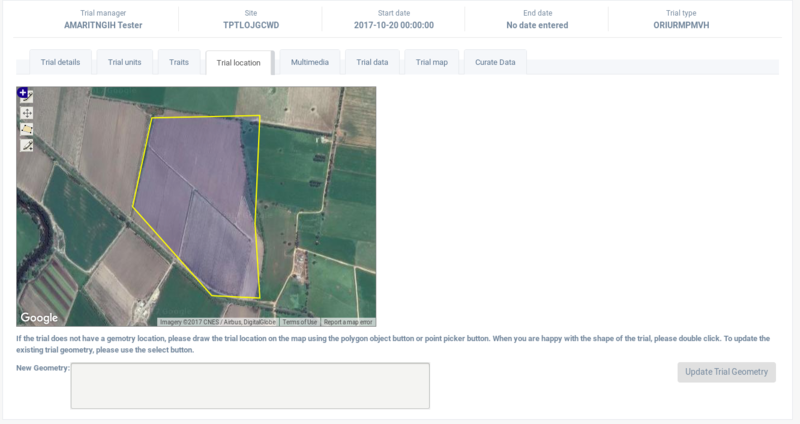 Users can then also download a trial field map in SVG format by clicking on (Download Field Maps) and download the set of printable barcodes by clicking on (Download Barcodes). Trial data can be uploaded, viewed and downloaded in the Trial data tab and the Trial map tab. Importing Trial data is performed differently in both tabs but will result in the same outcome. 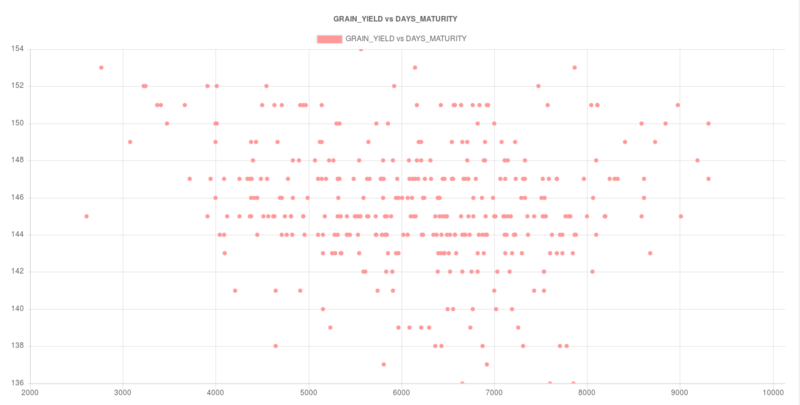 The method depends on preferred Trial data import template. 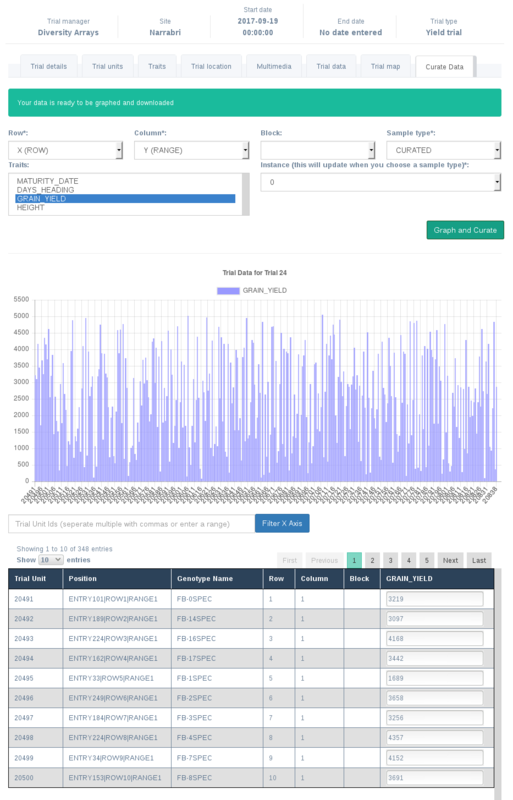 Once Trial data has been uploaded, Trial data can be viewed and downloaded on the Trial data tab. Trial data can also be viewed as a “heat map” in the Trial map tab. Currently only numerical trait values will be visualised. Exisiting Trial Data can be curated and imported as a seperate Instance in the Curate Data tab. Curated data will not always be imported as the same Instance. Instances are determined on a per trait basis. Nurseries can be defined and set up to allow for new crossings to be added. 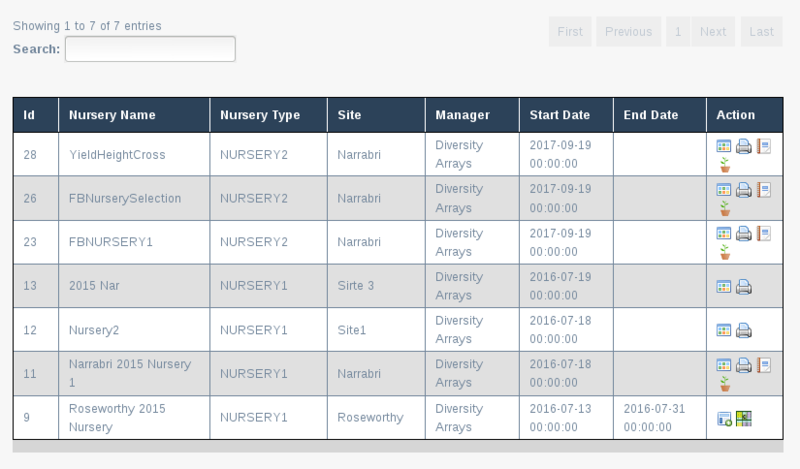 Selecting Nursery from the menu displays the list of defined Nurseries which the user/group has permission to view as shown in the following illustration. In the illustration above the Nursery window shows several Nursery records. The Actions cell has been highlighted on the second row to illustrate the range of buttons representing the Actions that can be performed for that Nursery. Action The actions that can be performed for the Nursery which are described in the following Nursery Actions section. The following table lists all the actions that can be performed for the selected Nursery in KDManage. Note: The presence of action types is dependent upon the Nursery state - not all action types will be available for all Nurseries. Generate layout and crossing Automatically generate layout and crossing, if required, from two Specimen lists. See Generate layout and crossing. Add Nursery Layout Import a nursery layout for nursery. See Trial Unit Layout. Display nursery layout for nursery Display the nursery layout for nursery. See Trial Unit Layout. Print Nursery Unit Barcode for nursery Export barcodes for nursery trials for printing. List Crossing for Nursery List crossing for nursery. Harvest Crossing If layout and crossing are present in nursery, harvest crossing. See Harvest Crossing. Crossing can be imported into nurseries, which can later be harvested to create new Genotype and Specimen entries. Note: Entries for Male and Female parent Ids must be Trial Unit Specimen Ids used inside the Nursery. Crossing File M Select the input file for the import. Trial Id Column M Column number for Trial Id. Note: Nurseries use Trial Id. 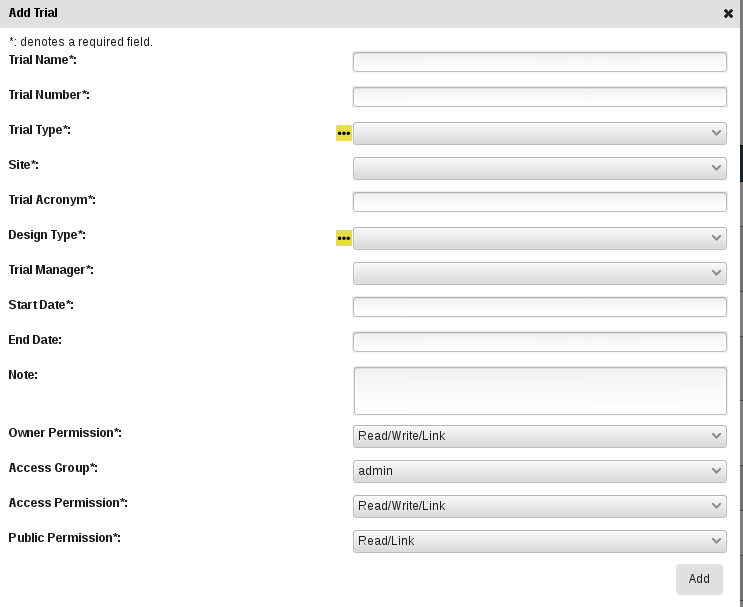 A layout and crossing can be automatically generated from two specimen lists. Note: Additional crossing and algorithm algorithms can only be added by advanced users. Breeding Method If a crossing will be generated, then a breeding method must be defined for crossings. Once a nursery has a layout and a crossing set up, users can harvest from crossing and create new Genotype and Specimens, with appropriate pedigree entries. The following table is a small nursery with a basic crossing. Each row refers to a single cross where a new genotype and specimen may be created. In cases where two specimens have previously been crossed, no genotype will be created and the new specimen will take on the Female Genotype. Genotype Prefix M The prefix for the newly created Genotype. A unique number will be generated and appended to the prefix. Specimen Prefix M The prefix for the newly created Specimen. A unique number will be generated and appended to the prefix. Selected If un-ticked, the corresponding crossing will skipped. Create New Genotype If un-ticked, the corresponding crossing will not have a new genotype created.